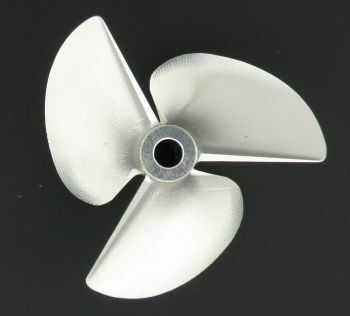 CNC 6114350 3 Blade Magnalium 7075 propeller. Machine cut to high tolerances makes this prop ready to use right out of the box. The Magnalium 7075 alloy makes this material upwards of 30% stronger than standard 7075 aluminum. Left hand rotation. These spin counter clockwise when looking at them from the back of the boat. Fits 1/4"(.250" 6.35mm) Smooth Bore Propeller Shafts.